Thanks to Stephanie Coffin for sharing her talent in sports photography! Windham had great teamwork right off the bat, communicating with one another and putting pressure on Westbrook early, with several shots on goal at the Saturday game held at Westbrook on October 14. Windham had great offense and defense in the first half, keeping Westbrook at bay. The Eagles were really pressuring Westbrook. Windham’s teamwork and hustle presented itself. 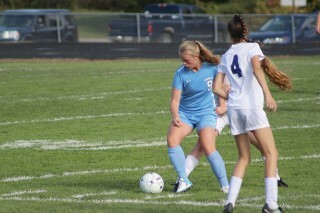 Meghan Hoffses, #6, scored. Shortly after, after a tense bout directly in front of the Westbrook goal, Julia McKenna, #40, headed the ball into the net, making it 0-2, Windham. The Eagles did not let up for the remainder of the first half and at halftime the score was 0-3, after Maggie Lloyd, #10, scored. The Eagles were just getting started. The second half began with Windham taking the field with tenacity. They wanted the big ‘W’ and they were going to get it. 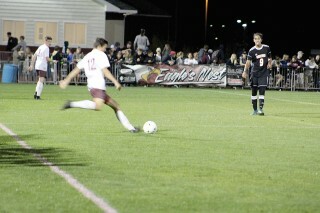 Their offense and defense continued to hold back Westbrook with the Eagles giving Westbrook’s goalie a workout. Meghan Hoffses was the first to put one in the net in the second half. Alanna Joyce, #1, followed, making it 0-5, Windham. The Eagles’ intensity was not done yet. Hannah Kaplan, #15, scored next and it was obvious Windham had opened the floodgates. Jordan Lloyd, #2, got one in to make it 0-7. Westbrook did manage to score once before the end of the second half, making it 1-7, Windham. The Eagles closed this away game, which they controlled most of, by Riley Beem, #7, getting one by the goalie, for a final score of 1-8, Eagles. “We would like to be playing our best soccer when it counts,” added James “Jimmy” Stewart, Assistant Coach. “The team has been coming together as a unit and players are becoming more confident in their roles. We hope to peak when it means the most." It was shaping up to be a perfect night for football as the crowds took to the bleachers to watch the Eagles (3-2) take on Scarborough (4-1) in Windham’s Homecoming game last Friday, October 6. Family, students and spectators had their sweatshirts and blankets and were prepared to root for their Windham Eagles, as it was almost time for Friday Night under the lights. 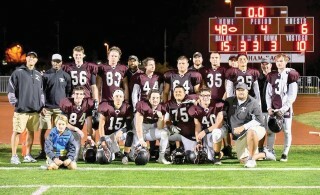 As the clock wound down to game time, excitement was in the air; Windham was fired up and ready. The Eagles took to the field with intensity. Scarborough scored in the first quarter, which only energized Windham to come at Scarborough with more power. Windham’s defense was tight blocking some key touchdown opportunities for Scarborough. Scarborough scored a couple more touchdowns in the first half, but that did not diminish the mood of Windham players or the mood of their crowd. 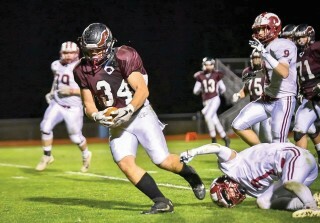 Windham did not get discouraged after a couple Scarborough touchdowns; they were determined to turn it around. After a personal foul on Scarborough at the very end of the first half moved the ball 15 yards in Windham’s favor, the tension was mounting as Windham was very close to Scarborough’s end zone. With less than 2 seconds on the clock and the end of the first half, #34, Treva Valliere, scored a touchdown. 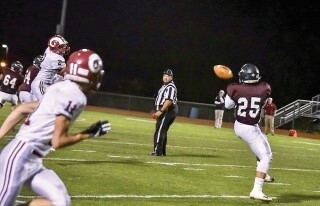 #16, Liam McCusker, punted the ball to get the field goal. At the end of the first half, the score was Windham 7, Scarborough 52. 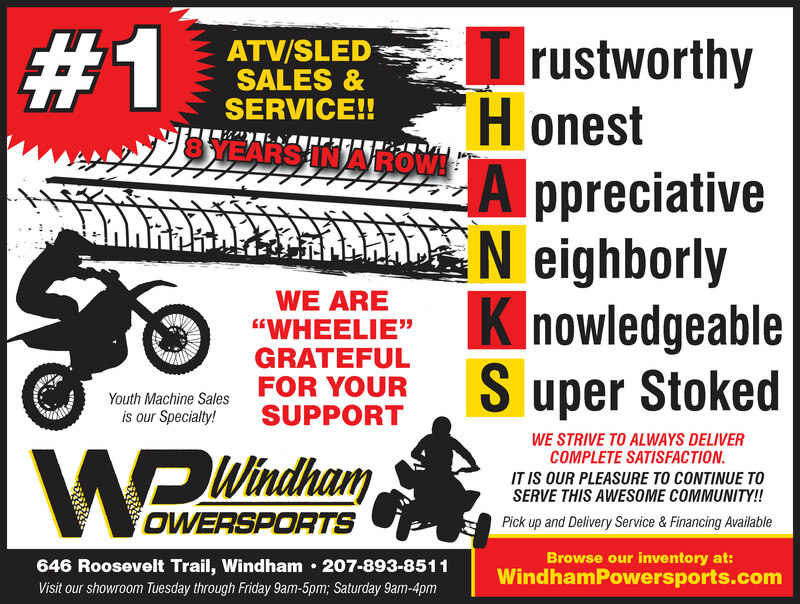 You may think Windham might have gotten a little down, but they definitely weren’t. ready to throw in the towel. A quarter later, Windham fought the good fight, but in the end, the final score was Scarborough 66, Windham 7. This was a tough loss, but it wasn’t for a lack of trying. Keep up the good work, Eagles. The Eagles next home game is Friday, October 20th vs. Bangor at 7 p.m.
On Tuesday, October 10 the JV boys took to the field with aggression, going strong right from the start. Though the Eagles had great defense, Biddeford did get one by in the first half. Braeden McCrillis, #19, scored for Windham in the first half. Trenton Atherton, #27, then scored with an assist from Braeden McCrillis. 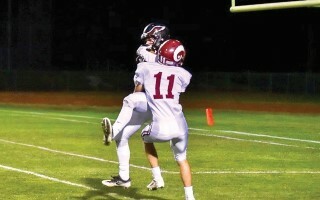 Windham played tough defense and offense showing they had come to win. The pressure was mounting towards Biddeford as Windham was giving 110 percent. Windham did an excellent job at keeping the ball away from their goal and more towards Biddeford’s. Windham continued their intensity taking several shots on the Biddeford goal. At the half, the score was Windham 2, Biddeford 1.
didn’t. They played excellent defense and offense not letting their aggression die down as they blocked several scoring opportunities for Biddeford and kept the ball away from the Windham goal. Jaime Luoko scored goal #3. Strong communication helped Windham edge out a lead in the second half. Connor Cummings, #23, scored for The Eagles making it 4-1, Windham. In the final minute of play, #32 Aiden Day scores with an assist from Connor Cummings. The final score: Windham 5, Biddeford, 1. The varsity boys took to the field with agility, not letting an early Biddeford scoring opportunity prevent them from making a comeback. Biddeford quickly put pressure on Windham scoring another goal, but Biddeford’s second goal didn’t diminish Windham’s energy. As the half continued, the Eagles turned up the intensity. Their teamwork and communication kept Biddeford at bay. Windham wasn’t going down without a fight. 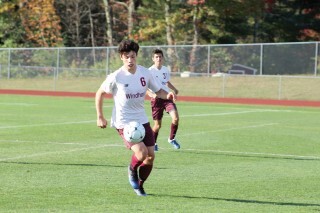 Michah Andujar, #6, scored Windham’s only goal in the first half. However, they were just getting started. At the end of the first half, the score was Biddeford 2, Windham 1. Windham takes the field in the second half ready to get that ‘W’, with Andrew Sawyer, #4, scoring immediately with an assist from Nick Rose, #15. Another Windham goal scored less than a minute later by Evan Glicos, #12, with an assist from Nick Rose. Windham was showing Biddeford this was far from over. The Eagles pressured Biddeford throughout the second half. Windham played strong defense keeping the ball towards the Biddeford goal, resulting in several shots on Biddeford’s goal for a lot of the half. 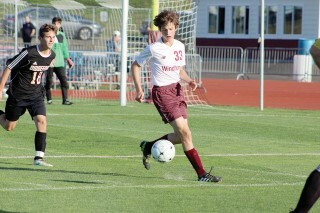 Nick Rose scored Windham’s fourth goal. After an exciting game, the final score was Windham 4, Biddeford 2. 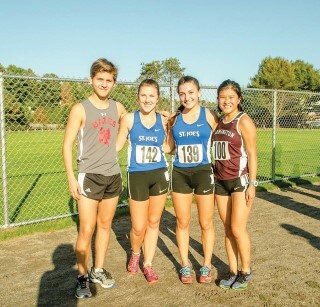 On Saturday September 30, 2017, the Windham High School Cross Country teams raced in the 16th Annual Festival of Champions held in Belfast, ME. 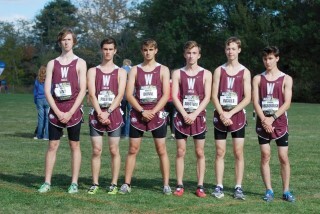 Being known for one of the fastest cross-country courses in the state, the Windham runners proved they were ready to take on the trails. Seventeen out of the nineteen lady Eagle runners toed the line and after crossing the finish, earned eight all time personal records (PR) and three season best (SB) times. Twenty nine out of thirty boy Eagle runners toed the line and after crossing the finish, earned fourteen all time personal records (PR) and eight season best (SB) times. 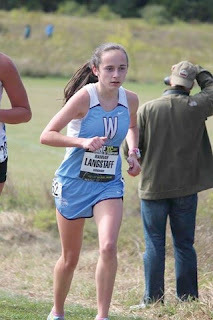 For the girls, Windham’s top runner, (Sophomore) Hailey Applebee ran a season’s best time of 19:54 for the 5k course. Hailey finished 42rd overall out of 759 runners on the day. 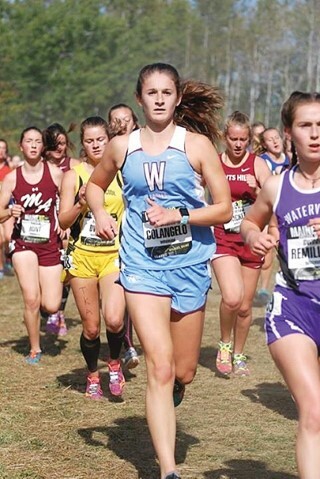 (Junior) Morgan Colangelo, returns for her second season with Windham XC. 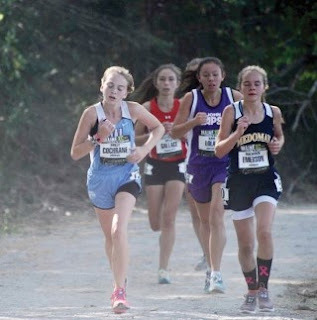 Morgan achieved an all time personal record with a time of 21:27, which is nearly a three-minute improvement since her first ever cross-country race in 2016. This performance earned Morgan a second-place finish for the team. (Junior) Abigail Clinch proved she came to fight for it, when she achieved a personal record with a time of 21:46, earning her a third-place finish with her team. Her time was nearly a seven-minute improvement over her very first cross-country race in 2016.
with only a torn spike and a bruised toe for Morgan. (Sophomore) Hannah Langstaff, known for her state qualifying time in the 400-meter race in track, joined the cross-country team this year. Hannah has made a nice transition to the 5k distance and earned a fourth-place finish for her team on the day, with a time of 23:57. Rounding out the top 5 finishers for the day was (Freshman) Molly Cochran, who had a breakout moment, when she crossed the finish line with a time of 24:04. Molly improved her all time personal best time by almost a minute, proving she is ready to compete in the postseason for the Eagles. 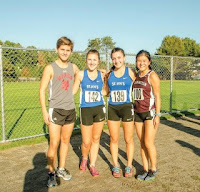 Supporting the top 5 scorers were sixth-place finisher, (Junior) Mikayla Baiguy, who ran with a time of 24:12 and seventh-place finisher, (Junior) Carly Witherow, who had an all-time personal record in a time of 24:22. 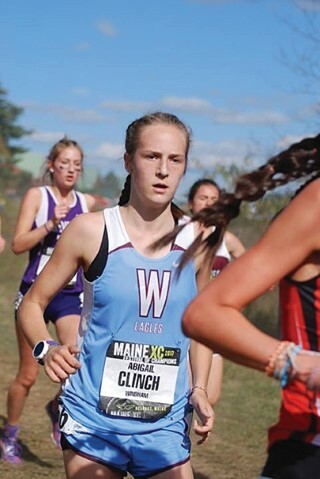 Female Eagle finishers 8 through 15 were as follows: (Junior) Becca Turner 24:27, (Sophomore) Anna Foster 25:00 (SB), (Senior) Danielle Meader 27:04, (Senior) Gabby Smith 27:10, (Junior) Savannah McLellan 28:32 (PR), (Freshman) Jessica McLellan 29:21 (PR), (Junior) Anya Shmanenko 30:09, (Senior) Natalie Walker 30:58 (SB). Did not run: (Junior) Allison Drew and (Sophomore) Miranda Delano. For the boys, Windham’s top returning runner, (Junior) Mason Rosborough, finished first for the Windham Eagle boys with a time of 17:39. 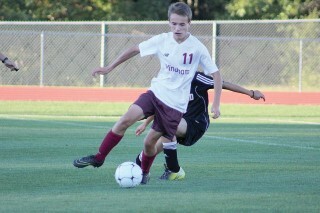 Mason does double duty as a Windham athlete, as he also participates on the high school soccer team. Mason finished in 94th place overall, out of 940 runners. (Senior) Wyatt Yost earned a second-place finish for the boys, with a time of 18:19, which was also a season best for Wyatt. Keep watching Wyatt as looking to get back to his sub 18 PR! (Senior) Kevin Ingalls pushed through the crowd, after nearly avoiding the big pile up at the start of the race. Kevin picked runners off one at a time and still managed to cross the finish line with a time of 18:46, earning him a third-place finish for the team. (Senior) Hunter Dionne, not once - but three times, avoided downed runners along the 5k course. Hunter narrowly missed his personal best time but crossed the line with an impressive time of 18:51 earning him a fourth- place finish for his team. Rounding out the top five, was a first-year cross country runner, (Junior) Connor Abbotoni. Connor became an instant contributor to the boys’ team and finished the race with a time of 19:06.
all-time personal best of 19:19. The seventh-place finisher (Senior) Jaren Preston, also finished with an impressive time of 19:28. Male Eagle finishers numbers eight through twenty nine are as follows: (Freshman) Tristan Candelmo 19:43 (PR), (Senior) Zach Harris 19:43 (PR), (Senior) Mitch Budroe 19:56 (PR), (Senior) Logan Cropper 19:57 (PR), (Senior) Owen March 19:57 (PR), (Senior) Callean Frechette 20:21 (PR), (Senior) Trevor Crowley 20:40 (PR), (Senior) Noah Hall 20:45 (SB), (Senior) Ethan Leech 21:05 (PR), (Junior) Sam Cole 21:07 (PR), (Freshman) Octavian Anghel 21:15 (PR), (Junior) Owen Wert 21:51 (SB), (Junior) Mike Ryan 22.18, (Sophomore) Davis Kinney 22:57 (SB), (Junior) Rohullah Habibzai 22:58 (SB), (Sophomore) Kobe Pillsbury 23:09 (SB), (Freshman) Mark Gedicks 23:24 (PR), (Sophomore) Dean Preston 23:52, (Sophomore) Derek Klimko 23:55 (SB), (Freshman) Robbie Soucy 24:02 (PR), (Junior) Gabe Ransom 24:09, (Sophomore) Zavier Cummings 24:42 (SB) Did not run: Stephen Sepulveda. The team’s score is calculated by adding up the finishing place for the first five runners to cross the finish line for their team. In the event of a tie, the score of the sixth and the seventh runners’ time may be utilized to break the tie. The goal is to have the lowest combined score. Girls finished in 33rd out of 62 teams and the boys finished 34th out of 68 teams. “The overall team race results/season standings don’t truly tell our cross-country story, our 2017 story is epic. Our story is found in the daily grind, in the endless pursuit that our athletes demonstrate daily, and in their proud smiles! Many will never fully know all that each of our athletes have accomplished, but they know and that’s good enough.” says coach Jeff Riddle. The teams are coached by Coach Jeff Riddle and Coach Tom Noonan. The Southern Maine Regional race will be held on Saturday October 21, 2017 at Twin Brooks Park in Cumberland, Maine. Windham came out strong and aggressive at the start of the game, ready for a win against Thornton. The junior varsity boys had good communication and played excellent offense and defense. Their speed and agility resulted in a solid game with the goalie (#30), Cam Brown, having several good saves in the first half. Both teams were battling it out, though at the end of the half, the game was scoreless. The Eagles came out determined to score in the second half. Windham continued their strong offense and defense, keeping Thornton at bay and really putting the pressure on them. In the final seconds of the game, quick hands by goalie (#01), Josh Lacombe, prevented Thornton from scoring. A well-played game for the Windham Eagles ended in a 0-0 tie. It was Windham Youth Soccer Night, so as the varsity team players took the field, they were accompanied by a youth soccer player (age 2-14). Windham took to the field with incredible intensity, advancing upon Thornton in the first minute of play. Windham started the game with strong offense and defense. 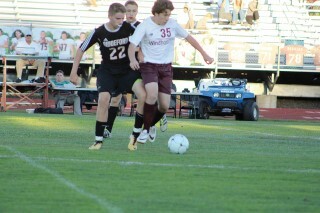 Tyler Woolston (#2), scored in the first half. The Eagles had great communication and teamwork in the first half of this impressive game. At the end of the half, the score was tied 1-1. At the start of the second half, Windham’s energy signified they were prepared to give Thornton a run for its money. And that they did. The Eagles kept up their intensity in the half. It was exciting as both teams fought to break the tie. Windham’s excellent teamwork did an impressive job of keeping Thornton from scoring in the half, which lead to regulation play ending in a 1-1 tie. We were headed to overtime. Windham did not slow their energy in overtime. Unfortunately, a controversial off-sides call ended the game with the final score Thornton 2, Windham 1. It certainly was. Well played Windham.